Picking out your first drum set can seem overwhelming, especially with so many different brands and models available today. Selecting the right product can make or break your experience, so we have configured some of our favorite drum sets for first-time buyers. Manufactured with Pearl's legendary commitment to drums, these sets are guaranteed to give you the best return for your investment. 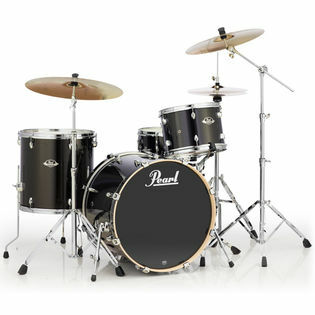 While supplies last, purchase a Pearl Export 4-Piece Shell Pack in Black Gold Spakle for only $299.95. 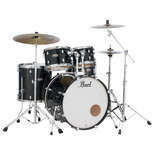 The Pearl Export 4-Piece Drum Set includes 22" x 18" Bass Drum, 13" x 9" Rack Tom, 16" x 16" Floor Tom, and 14" x 5.5" Snare Drum. Limited quantities are available. Features a beautiful black gold sparkle finish and high quality export shells. 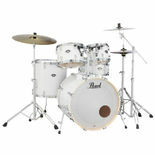 Includes stand for 13" tom, but no other hardware or cymbals are included. Pearl's Export Series offers a sonically advanced recipe of strategically arranged plies of premium wood to maximize frequency response of every component. As with all Pearl drums, each shell is formed with the legendary SST construction process that uses extreme heat, Precision-cut scarf joints, proprietary Acoustiglue and over 1000lbs of hydraulic pressure to create the ultimate acoustic air chamber. Want more options? 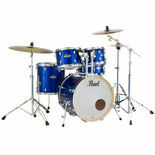 View our complete collection of Pearl Drumsets to find a kit that is sure to fit your needs.